Season runs Jan to May. 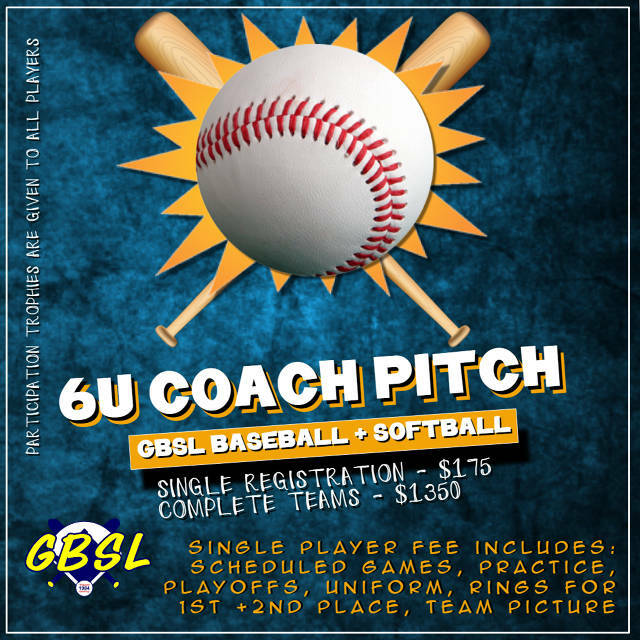 On behalf of the Board of Directors of GBSL Baseball & Softball League, we would like to extend our most sincere welcome. 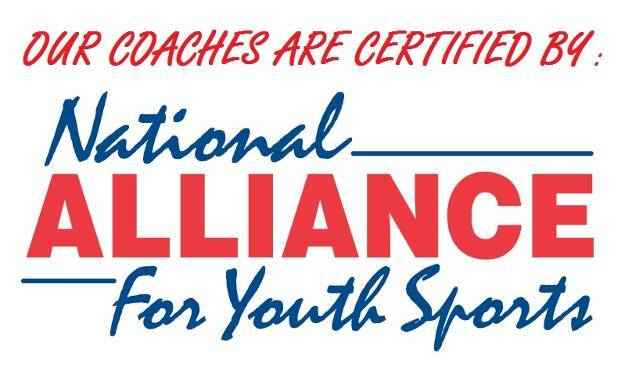 It is the goal of this league to teach our players the fundamentals of the game as well as the camaraderie associated with a team sport. We have been located at this site for over 30 years and have built a reputation of being a family oriented league. Please help keep it that way. 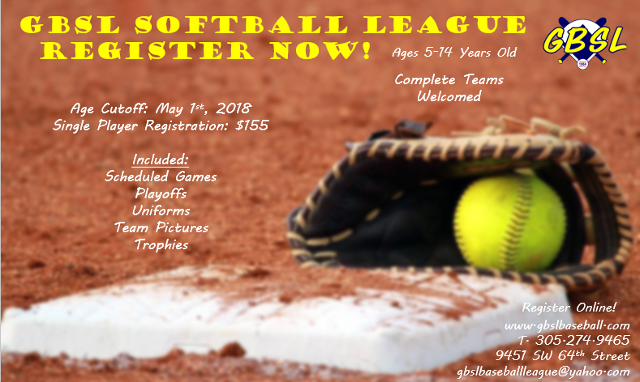 Understand that GBSL is a non-profit organization made up of volunteers that partake in the everyday functioning of the League. Such daily activities like field preparation, bathroom cleaning and trash pick up are done solely by volunteers. Your cooperation in keeping our grounds clean is greatly appreciated. 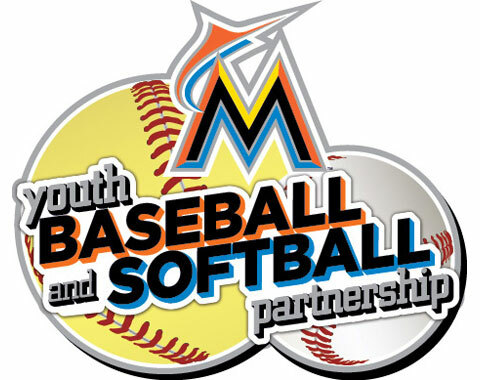 Also note that GBSL receives no funding from Miami Dade County or the School Board. 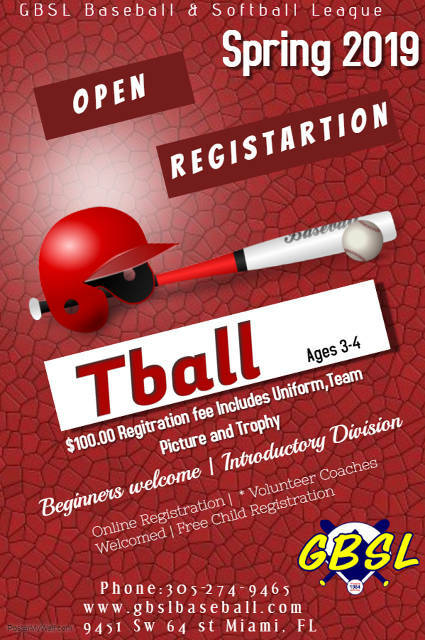 Funds come from registrations and donations made to the league. We hope you and your child enjoy the upcoming season. 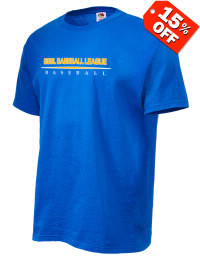 If in anyway you can assist with the functioning of this league, by all means stop by the office and offer your help. In closing, please allow us to be a good neighbor by abiding with parking as permitted by and indicated by posted signs (there is additional parking available in the school parking lot). 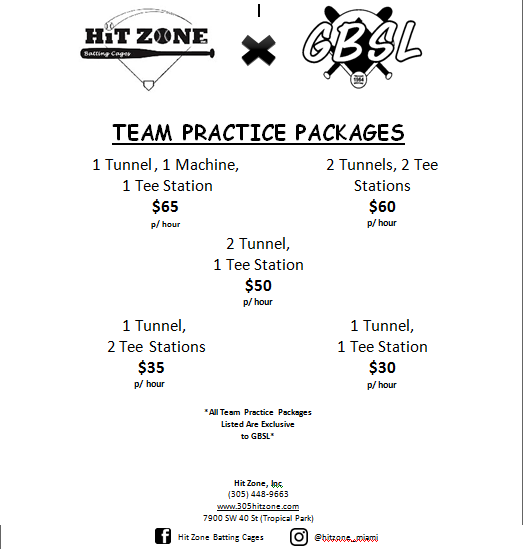 Parking for guest and invitees of GBSL Baseball is located on 94th avenue, in the school teacher parking lot. All guests of GBSL are directed to park in the parking lot. Please make sure you read GBSL Ground Rules for the appropriate division you will be playing in PRIOR to the start of the season. 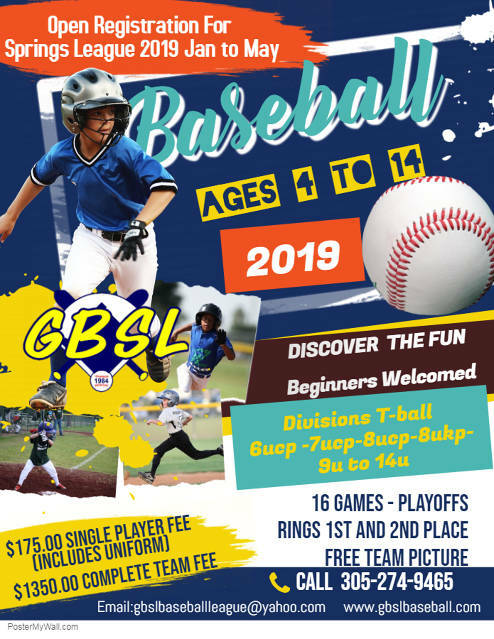 If you have any suggestions regarding a particular rule, a rule change, or rule addition, please feel free to email us at gbslbaseballleague@yahoo.com and we will be more than happy to discuss it in our next committee meeting. 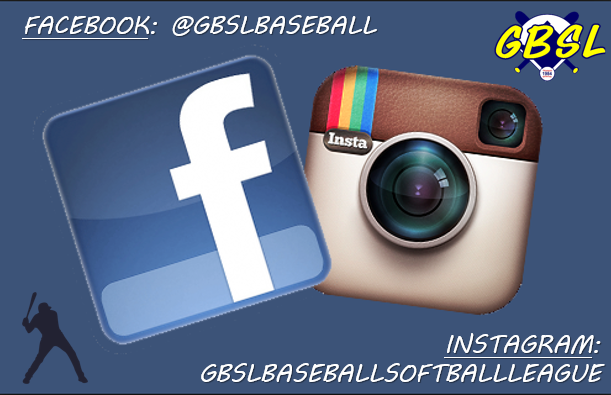 GBSL Baseball & Softball League Ground Rules can be found under handouts.